Five years in the making, this brilliant, in-depth investigative reporting on the history, politics, and science of alcoholism will show how AA became our nation's de facto treatment policy, even as evidence for more effective remedies accumulated. 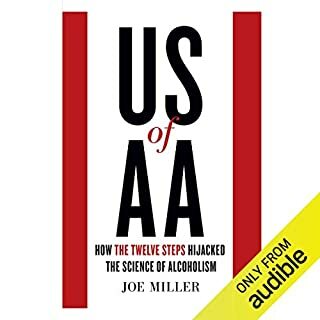 US of AA is a character-driven, beautifully written exposé, full of secrecy, irony, liquor industry money, the shrillest of scare tactics and, at its center, a grand deception. US of AA shines a much-needed spotlight on the addiction treatment industry. It will forever change the way we think about the entire enterprise. The tragedy of the Donner party constitutes one of the most amazing stories of the American West. In 1846, 87 people, men, women, and children, set out for California, persuaded to attempt a new overland route. After struggling across the desert, losing many oxen, and nearly dying of thirst, they reached the very summit of the Sierras, only to be trapped by blinding snow and bitter storms. Many perished; some survived by resorting to cannibalism; all were subjected to unbearable suffering. In 1587, 115 men, women, and children arrived at Roanoke Island on the coast of North Carolina to establish the first English settlement in the New World. But when the new colony's leader returned to Roanoke from a resupply mission, his settlers had vanished, leaving behind only a single clue - a "secret token" etched into a tree. What happened to the Lost Colony of Roanoke? That question has consumed historians, archeologists, and amateur sleuths for 400 years. In The Secret Token, Andrew Lawler sets out on a quest to determine the fate of the settlers. Cutting through 160 years of mythmaking, best-selling historian Michael Wallis presents the ultimate cautionary tale of America's westward expansion. "Westward ho! For Oregon and California!" In the eerily warm spring of 1846, George Donner placed this advertisement in a local newspaper as he and a restless caravan prepared for what they hoped would be the most rewarding journey of a lifetime. But in eagerly pursuing what would a century later become known as the "American dream", this optimistic yet motley crew of emigrants was met with a chilling nightmare; in the following months, their jingoistic excitement would be replaced by desperate cries for help that would fall silent in the deadly snow-covered mountains of the Sierra Nevada. We know these early pioneers as the Donner Party, a name that has elicited horror since the late 1840s. Now, celebrated historian Michael Wallis - beloved for his myth-busting portraits of legendary American figures - continues his life's work of parsing fact from fiction to tell the true story of one of the most embroidered sagas in Western history. Wallis begins the story in 1846, a momentous "year of decision" for the nation, when incredible territorial strides were being made in Texas, New Mexico, and California. Against this dramatic backdrop, an unlikely band of travelers appeared, stratified in age, wealth, education, and ethnicity. At the forefront were the Donners: brothers George and Jacob, true sons of the soil determined to tame the wild land of California; and the Reeds, headed by adventurous, business-savvy patriarch James. In total the Donner-Reed group would reach 87 men, women, and children, and though personal motives varied - bachelors thirsting for adventure, parents wanting greater futures for their children - everyone was linked by the same unwavering belief that California was theirs for the taking. Skeptical of previous accounts of how the group ended up in peril, Wallis has spent years retracing its ill-fated journey, uncovering hundreds of new documents that illuminate how a combination of greed, backbiting, and recklessness led the group to become hopelessly snowbound at the infamous Donner Pass in present-day California. Climaxing with the grim stories of how the party's paltry rations soon gave way to unimaginable hunger, Wallis not only details the cannibalism that has in perpetuity haunted their legacy but also the heroic rescue parties that managed to reach the stranded, only to discover that just 48 had survived the ordeal. An unflinching and historically invaluable account of the darkest side of Manifest Destiny, The Best Land Under Heaven offers a brilliant, revisionist examination of one of America's most calamitous and sensationalized catastrophes. ©2017 Michael Wallis (P)2017 Audible, Inc.
Where does The Best Land Under Heaven rank among all the audiobooks you’ve listened to so far? If I were to rank it with ALL audiobooks, it's not at the top of the list. 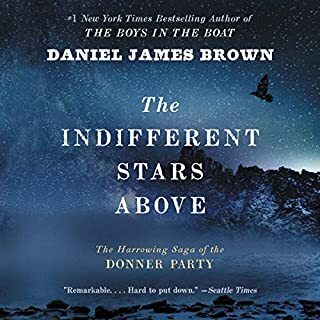 It's not even at the top of the list for the four Donner Party books i've read, due to the performance. I don't know if the author's ego got in the way of making him think that he would be the BEST interpreter of his own work. I hate to break it to him, but he should have hired a professional performer for a story of this caliber. This was my fourth book about this story and I attend the Donner Party Hike in Truckee each fall. 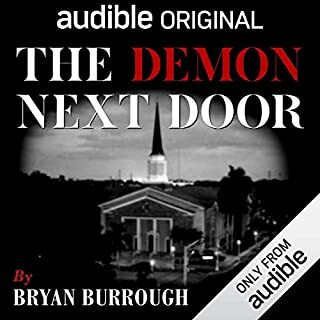 I loved the extra information that I had never heard before, but being an audio book, there were no footnotes; this led me to believe that some of the information was just supposition for dramatic effect. It was only truly telling when the author read an actual passage from a dairy or article. How would he have known some of the things that were never quoted or sourced? How would he know that the meat of the bison was lean? How would he know that the Hastings book was so useless to the party that they used it for kindling and toilet paper? On a good note, there was so much new information that this makes me curious enough to get the hard-copy of this book and check out the sources. What was one of the most memorable moments of The Best Land Under Heaven? The poor decision to take the Hasting's cutoff after being advised not to. The trouble that the cutoff presented to the party (especially the lost time). James Reed murdering John Snyder. The murder of the Miwok Indian guides for their flesh. And definitely, the afterward. Usually, this story ends with a happy springtime rescue. There was evidently more at hand here, and I relished the additional information never gleaned before. I tend to think of the performance of an elderly alcoholic grandfather telling a bedtime story, as there were cadences that ended as if there would be a spitting sound into a brass spittoon, or perhaps a wad of vomit exiting his vocal canal. Or, on the bright side, think of an old-timey gold miner spinning a yarn. It just could have been better. 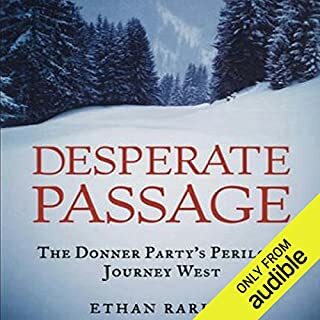 For the Donner story, I prefer the performance from Desperate Passage: The Donner Party's Perilous Journey West by Ethan Rarick. I wish that there was a downloadable accompanying PDF with maps and photos. 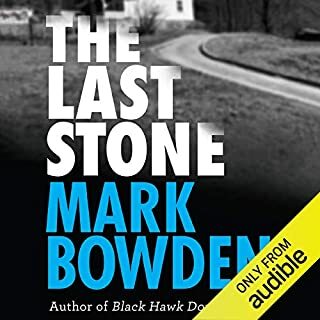 I'm no history buff but I enjoyed this audio book very much and found it hard to pause for a break. I recall learning of the Donner Party in grade school but this account offered much more detail and made me think about the tragic events in a new way. Wallis was an amazing narrator and I couldn't imagine listening to another voice. I've never shown much interesting history but after hearing about this book on NPR, I felt I needed to give it a try. I was not disappointed. Of course, I knew that the Donner party was a group of settlers who got caught in the mountains over winter and had to resort to cannibalism to survive. But I knew nothing of all of the perils that faced them before and after they were stranded. I am amazed that any of them survived, let alone 46 of them. I highly recommend this book to anyone and everyone. It will make you feel very differently when you find you're having a bad day. No bad day today could ever compare to that of the Donner party members. 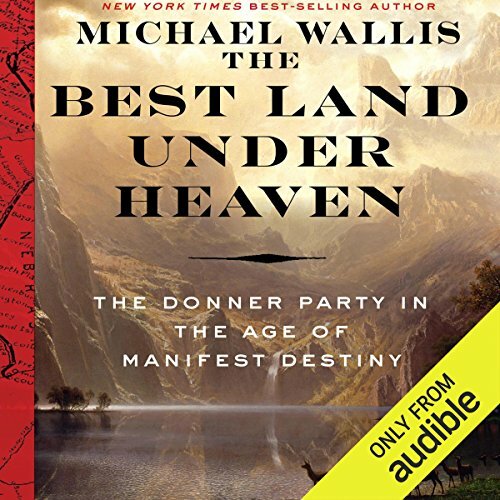 I was looking for a quality text about the Donner-Reed party and almost didn't get this book because of the many reviews complaining about narration style. I think given the subject matter (the history of the Old West), Michael Wallis is perfect for the role, and reads his account with the gusto of an old trail hand or woodsman spinning a yarn by the fireside. Is it crisp and polished? No. Is it hella entertaining? You know it. 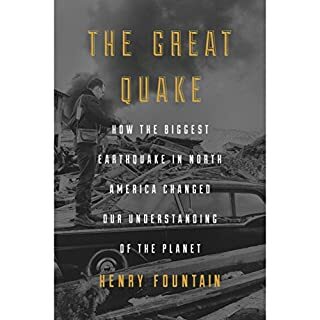 This is an incredible book, loaded with historical detail, primary sources, and a very helpful broader context of settlement and Manifest Destiny to flesh out (pun in bad taste but definitely not intended) the actions and decisions of the party. The story moves with the runaway energy of a thriller, and at times has the gravity and pathos of a tragedy. Don't pass up a fantastic listen. enjoyed learning about the tragic story of the Donner party. Recently moved to Reno,NV and visited the museum, Donner Lake and Donner Pass. I had no idea. Everyone summarizes the Donner Party as: they got trapped in the snow and ate each other. Biggest oversimplification EVER. At Chapter 12, I lost my ability to follow the narration. At times overly dramatic, choppy, and slurred, I wish Mr. Wallis would have selected otherwise. The story is very interesting and educational albeit maybe a bit too detailed. Listing all the supplies was not valuable. Did not enjoy the narration. Needs someone with a better cadence. Not sure who would enjoy this reading. I imagine it is historically accurate, but the repetition detail, of names, and slow slog were not compelling. What didn’t you like about Michael Wallis’s performance? I found the author’s reading ponderous, overly dramatic and somewhat irritating. While his voice is very good - nice timbre, deep; his reading came across as amatuerishly dramatic. This book was a selection for my book club - otherwise I would not have selected it. It tells a grim tale - and the final stages seemed to fall into an almost ‘Lord of the Flies’-version of humanity. Not for me. Well researched; more comfortable campfire storytelling style. The word emphasis at times did not always match the intent, although the correct wording was present. This was interesting with all the content, but not a novel and pick up and read. Take some time to digest the information and perhaps rewind a few parts. If this era interests you, then you would come away with more insight.